“I have a confession to make: I still do love Gothic Rock. A lot. This love has somewhat been tainted, strained and fatigued in the past few years, though, due to mostly uninspired, unmotivated and really, really boring releases. The first love child of James Tramel (The Wake), Lars Kappeler (Sweet Ermengarde), Ger Egan (This Burning Effigy), Tommy Olsson (The Morendoes) and Simon Rippin (The Eden House) a.k.a. 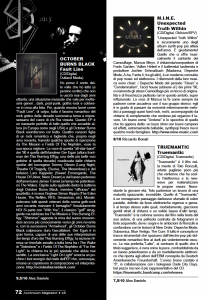 October Burns Black…..is, without the shadow of the tiniest doubt, one of the best outputs this genre has had to offer in what seems like aeons. …..I’m extremely happy that I pitched my old pal Lars for this role as his work on their debut “fault line” EP is basically flawless. The same goes for James’ sinister bass lines, Tommy’s guitar work, and Ger’s vocal performance. If you add Peer Lebrecht’s (Phøniques Arts) creativity and design skills as well as the undeniable passion and drive that Ed Shorrock (Outland Media) brings to the table on the management side of things, this particular 4 track gem is a must listen for each and every fan of the genre. Nothing fancy. No gimmicks. Pure Gothic Rock. 21/09/18 INTERVIEW WITH JAMES AND LARS IN ORKUS! We are fortunate to have been able to borrow some valuable time and webspace from the fine individuals at Ambient Light. They have put one of their finest on to the job to deliver thoughts on fault line, musically and strategically. A dissection of the background, approach and tracks, this review provides yet another angle on the project, for which we are indebted. 20/07/18 REVIEW OF FAULT LINE ON WWW.POST-PUNK.COM. Time to dust off your crimping iron! A while back, our editor Thomas Thyssen, upon hearing that James Tramel of The Wake was looking for musicians to start a new project, suggested he recruit Lars Kappeler of Sweet Ermengarde be recruited as a guitarist. 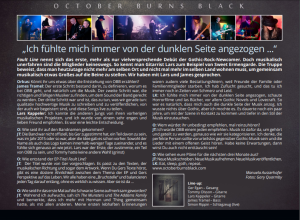 Now, joining James in addition to Lars, is Ger Egan of This Burning Effigy, Tommy Olsson of The Morendoes and Simon Rippin of The Eden House, all together forming the new Gothic Rock supergroup October Burns Black. In our first radio interview James is interviewed by The Green Widow on Necromancy Radio, a station created during the winter of 2016 in Melbourne, Australia. In this piece James talks about OBB’s origins and objectives, its primary intention to play live as much as possible and how it works given the international footprint of its members. A few personal insights into James’ past with The Wake also pop up along the way. Finally, and perhaps most importantly, the upcoming tour to the UK in April (check out the GIGS page) with our fellow road travelling friends gets a heads up. See you on the road…….